Of the 50 web hosting services reviewed by NCM Online, only a very few managed to meet all of the criteria listed above. Of those, one company clearly stood out amongst the rest. A2 Hosting’s Affiliate Program provides a substantial $85.00 commission per new customer referred by affiliate link, one of the highest compensation rates in the industry. Program members also earn $5.00 for sales referred by other affiliates who signed up for the program via their link. Further, and unlike some other web hosting companies, affiliates are paid the top commission rate whether they refer 100 sales per month or only one. Better still, according to statistics compiled by NCM Online, A2 converts referrals into sales at a rate of better than 5%. Additional affiliate program highlights include: fast and reliable PayPal payments on the 15th of every month; 90-day cookie life; triple-redundant tracking to assure proper crediting of referred sales; and real time traffic logs and statistics. 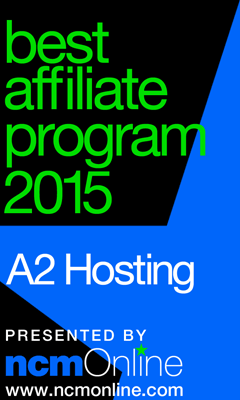 NCM Online is proud to present its Best Affiliate Program Award for 2015 to A2 Hosting.